Someone asked me to put up a pic of this chair when I was done. 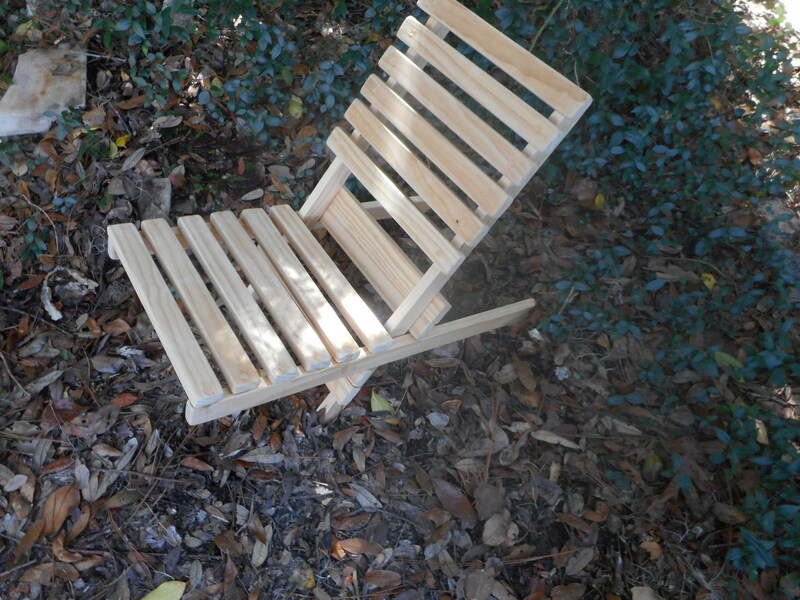 Mainly for Rendezvous and festivasl I built this chair from soft pine. Easy to work. Inexpensive. I thought it might be too small so I went with quick and dirty. Then I thought, "That is going to collapse when I sit down." so I added 2 reinforcing slats on the load bearing cross pieces. It's not too small. Next time I'll get some oak or cherry and those won't be necessary. I just need to put on some bees' wax and orange oil and I'm good for this 'vous. Tony, it might have been me that asked for the pic when you were done. It came out very good and I like the slat back on it. Mine have a canvas back which is okay but the slats might be a lot stronger. The collapsible rendezvous chair comes in several designs. Some guys give the seat and back a curved design, so the back is concave and the seat is convex.....I could never see that it was advantageous to do it that way, though. When making the seat and back curved, you naturally end up with cross-grain built ino the sides of the frame pieces.....a natural place for them to break. Since you reinforced the cross-members....you will have a workable camp chair for as long as you live. Thanks guys. It's screwed and glued. Feels solid. The bees' wax and orange oil is darkening it a bit. I like it. I didn't stain it because it seemed like an extra step a poor longhunter wouldn't take. I'm glad I didn't. He wouldn't really have a chair at all but I can't do that for 11 days anymore. The cool thing about this reenactment hobby is that you never stop learning. Shout out to Hushnel for getting me into it.